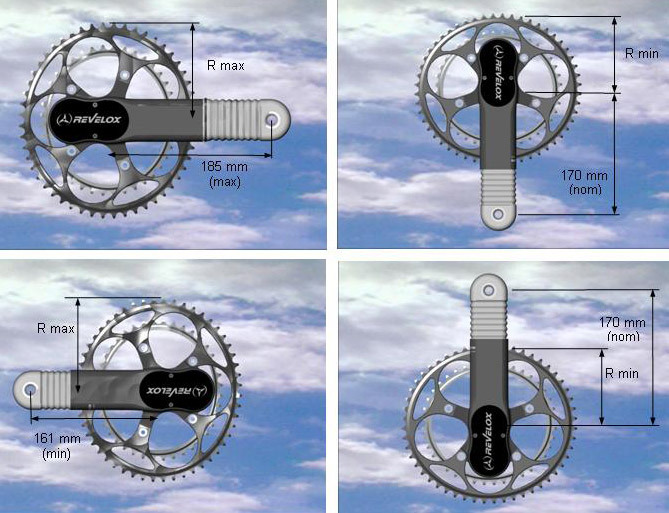 REVELOX has developed a new and very innovative bicycle crankset. Here is a first video, showing the V6 prototype in action. 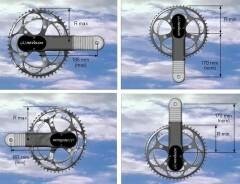 The Revelox crankset version RC1 is planed for 2008. See page technical info for more details. We divide the cycle in 4 phases with 2 power (push and pull) and 2 transitions (Upper and lower). The pushing phase provide the most of the power generation (>80%) in reason of the intensity of the effective force (F), where the maximum value is obtained at near 90 deg. The negative work over the positive work (W-/W+) varies as a function of the cyclist’s ability the to keep a continuous and efficient pattern, but mainly of the cadence(RPM), the load (Watts) and the physical intensity level (VO2). In some cases this ratio can reach up to 27% (130RPM, intensity 60% of MAP). See the following study. 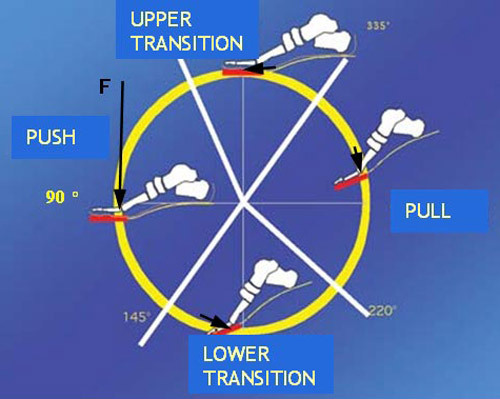 It consist of modifying mechanically, the trajectory of the pedal path and the tangential speed of each pedal, in order to generate an increased mean torque to the rear wheel at each crank rotation and for the same amount of energy produced by the cyclist. Each crank arm extends and retracts independently and are synchronized to improve the efficiency thus the power produced during the push phase in particular. 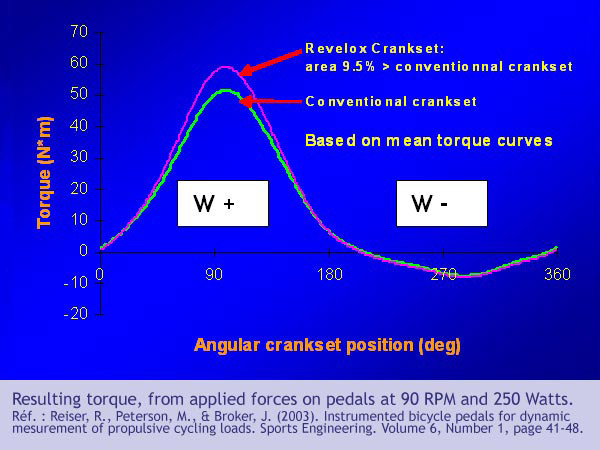 The proportions between the crank arms extensions and the oval shaped chainrings, gives a smooth, more efficient pedaling pattern, in the range of mean cadence and power. The figures below shows the crankset at 4 key positions, equipped with a combination of 40 and 52 teeth chainrings. As well as providing a better gross efficiency, the Revelox crankset procures a training tool helping to improve the quality and intensity of forces, applied during the transition phases. Copyright © 2002-2008, Revelox Inc. All rights reserved.